After arriving in Guyana, I was picked up at the international airport and driven into Georgetown. This is about a one hour drive. Early the next morning I was picked up from the hotel and brought to the local airport, Ogle, for a flight south into the rain forest area to Annai. The Ogle airport is only a few minutes drive from the hotel. All the internal flights were with Cessna C-208 Grand Caravan airplanes, small single engine turboprops. In Annai we had breakfast at the Rock View Lodge, and then drove about 1.5 hours to the Surama Eco Lodge for one night. In the afternoon we walked around the village, and later did a night walk through the forest. The next morning we left early to walk to the Burro Burro River for a paddle boat excursion on the river. After lunch we drove about 2 hours to the Iwokrama River Lodge for two nights. The Iwokrama lodge is located on the Essequibo River. During an afternoon walk through the forest I saw various birds, including the Red-and-green Macaws (Ara chloropterus, german: Grünflügelara, french: Ara chloroptère), which are very impressive. A night boat ride on the river rounded out the day. Wildlife is spotted by the search light reflecting in their eyes. We saw one Black Caiman. Most impressive was to even find a large moth by the reflection of light in its eyes. The next morning we went on an early morning boat ride on the Essequibo River to do some bird watching. After breakfast we took the boat down river to a hike up to Turtle Mountain. Turtle Mountain is about 300 m (980 ft) high. Since I hike almost every day at home in the mountains around Phoenix, it was an easy hike. What made it somewhat uncomfortable was the temperature (35°C (95°F)) and the humidity (95%). I worked up quite a sweat, my clothes were soaking wet after the hike. But it was worth the hike, the view from the top is great. I was lucky to see a group of Spider Monkeys on the way up the mountain. In the afternoon I went on another boat ride to the Kurupukari Falls to see Amerindian Petroglyphs. We saw various birds on this excursion as well, including some hummingbirds. The next morning we drove south through the forest to the Atta Rainforest Lodge. Again, the bird life was very interesting along the way. In the afternoon we walked through the rainforest for nature watching. We saw several monkeys, as well as various birds, including Red-and-green Macaws and Scarlet Macaws, as well as several parrots. Early the next morning we went on another bird watching walk. After breakfast we started the drive to Annai for one night in the Rock View Lodge. On the way to Annai we had a brief glimpse of an Ocelot, one of the large cats in Guyana. In the afternoon I went on a bird watching hike in the savanna around the lodge, and again the next morning on a bird watching hike on Pacaraima Mountain. Bird watching around the Rock View Lodge was very interesting. After the morning hike I took a flight back from Annai to the Georgetown Ogle airport for another couple of nights in Georgetown. The next day I took a day trip to Kaieteur Falls, again in the small Cessna C-208 airplanes. Kaieteur Falls is spectacular. We circled around the falls for some pictures before landing at the airport near the falls. A short walk brought us all the way to the falls. 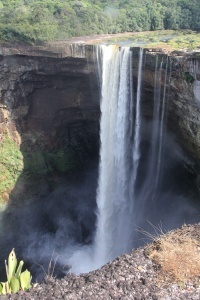 After a couple of hours around the falls, I flew back to Georgetown for the last night in Guyana. The next morning I continued my tour with a flight to Suriname from Ogle airport. 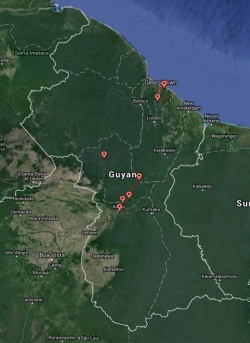 Guyana is a small country, about the size of the USA state Idaho. With a population of only some 735,000 it is mostly uninhabited. Almost 1/3 of the population lives in the capital Georgetown. It used to be a British colony, British Guiana, it became independent in 1966, and is now a stable democracy. The hotel in Georgetown was fairly good, but the food and beer was somewhat expensive ($4.50 for a small bottle of beer of 250 ml (8 oz)). The accommodations in the lodges were basic but good. All had private bathrooms, but no hot water. With the temperatures around 35°C (95°F), hot water is not really necessary. The beer in the lodges was somewhat expensive, similar to the hotel in Georgetown. The food in the lodges was very good. The Atta lodge was the least satisfying accommodation. They didn't have beer and they charged for the Internet connection, but the food was good. I didn't see as much wildlife as I was hoping. I didn't see many larger animals, just a short glimpse of an Ocelot, and the Black Caiman (Melanosuchus niger, german: Mohrenkaiman, french: Caïman noir). But the bird watching was good. Especially the macaws were splendid.